1. Fish and shellfish are naturally tender and require minimal cooking. A microwave oven helps preserve their natural juices and delicate textures. 2. 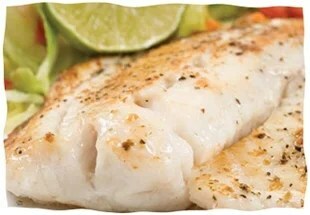 Fish fillets and steaks cook best in shallow round or square baking dishes that can be rotated in the oven. For even cooking, arrange fillets with thickest portions at the edge of the dish. Thinner portions of fillets should overlap in the center. 3. Juice from extremely moist fish, especially flounder collects on the surface as it cooks and detracts from the appearance. To prevent this, line the dish with paper towels to absorb the liquid. Or arrange the fish on a trivet placed inside the dish. 4. It’s easy to cook fish. Always test for doneness after the minimum time suggested in the recipe and after it stands covered 3 to 5 minutes. For standing time, place the fish flat on the counter to hold in heat that continues to cook the fish. 5. For microwave cooking, when fish turns opaque, it’s done. If you follow the time for conventional cooking (cook until fish flakes with a fork), you will have gone too far. The center should be slightly translucent at the end of the cooking time and will become opaque during the standing time. If after standing the fish doesn’t appear done, microwave an additional 30 seconds. Keep fish covered so that edges stay moist and center cooks completely. 6. Fish and seafood do not retain heat as well as some other foods. Make sure the rest of the meal – vegetables, salad, bread – is near completion before microwaving fish. 7. The microwave can even make shucking oysters easier. While the shells will not open completely, the muscles will relax, making the job easier. Use warm (30% power) to open the shells but not cook the oysters. For fully cooked oysters and ease of opening in one step, use high power. See specific instructions for shucking in Dressed Oysters on the Half Shell. Arrange the oysters on a platter with the hinges toward the center of the plate so that you can watch for the shells to open.